First up, I’m a young fit adult who does regular exercise through cycling throughout the year, including through the hottest parts of Summer. I have no particular predisposition to heatstroke. The following events happened on Wednesday as a prelude to the topic of this discussion. I met with a friend for Lunch, and was heading into work for the afternoon around 1:30pm (thanks flex-time). I got in the car to drive over to work after it had been parked in full sun. I maxed out the air conditioning (A/C) in order to counter the intense heat of the cabin. I received a call on the handsfree bluetooth while driving, and due to the relatively crappy nature of my car’s microphone, I had to cut the background noise of the A/C going full blast by turning off said A/C. Over the 2 minute phone call, the car temperature skyrocketed up to the point where I was starting to struggle with concentration. I had to end the call abruptly so I could resume the life support that was air conditioning. Later in the afternoon, I happened to be doing the grocery shop at Woolworths Majura Par. I decided I needed to pick up a few hardware items from Masters. Rather than moving the car again, I decided to leg it across the carparks to Masters, which turned out to be the best part of a kilometre in distance. The heat on the asphalt was oppressive, and by the time I got into the store I was sweating buckets. As I was picking out my items from the irrigation aisle, I overheard a man a few metres away with one of the sales assistants. The topic was fairly mundane, but my ears pricked up when the man said “I had better go, I’ve got the kids in the car”. I sneaked a look at the middle aged father and had a quick think. Has he really left his kids out in the car on a day like this? To my mind, (and no I don’t have kids yet), it is not OK to leave the kids in a hot car while you bathe for minutes on end in the air conditioned shops. For those who haven’t seen this video, it’s a pretty confronting indicator as to the potential severity of this decision. I didn’t call him out at the time, but I wish I had now. Another day and no lesson learned. I acknowledge I have a pretty strong viewpoint on one side of this argument. What do you think? personally , i have never seen anyone leaving his/her small baby into the car all alone like that! Even if it is not about the car heating up, babies are not to be left alone like that . that is why they are ‘termed’ as ‘babies’ and we as ‘adults’ who should take care of them. At some point over the last 25 years, we’ve become soft. I still remember as a kid of the 80’s it was not exactly uncommon for mum to leave us in the car whilst she would quickly run into the shops and pick something up, and back then we did not have a car with air conditioning. Instead of this current “oh my god won’t someone please think of the children” levels of craziness which we now see, most of us humans used to be able to judge risk and danger. In a way I’m also susceptible to this. I realised that my 7 year old daughter is the same age I was when I used to go riding my bike up Simpsons hill with a mate of the same age. The basic rule was be home before dinner time (which I managed to do most times), and don’t get into trouble. We had no mobile phones, no GPS trackers and no way to get in contact with our parents / vice versa, and yet that was considered normal. These days we’re questioning if we’d let our daughter walk 6 houses down to a friends place by herself. As for the OP, unless you actually saw kids in the car in distress, honestly you know nothing. A vague comment over heard by someone who was not directing that comment to you. How do you know it was not his wife and kids? How do you know that his kids where not 17 and 19? How do you know that there was even kids involved and it wasn’t just an excuse to get out of there? Finally, to put it bluntly, the moment you have kids is the moment you realise that you don’t actually know anything about kids. Until then, non-parents always feel that they know more about kids than parents do (another thing I myself was guilty of, I thought I knew all there was to know about kids until I had some of my own). You overheard something, you didn’t act on it, so that’s the end of it really. Anything else is just wild speculation. 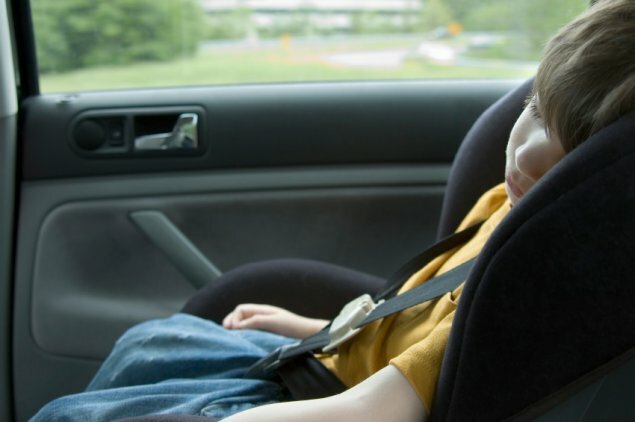 Should you come across the kids in the car first as opposed to the parent, call NRMA. Select the option for ‘child or animal trapped in the car’ and they will send someone out to get them out, free of charge, and you are not liable for damages sustained during the prison break. That’s all well and good in theory. But it’d still take them precious minutes to get there. In the case of the video above, the kid had already passed out. If I came across that situation, I wouldn’t mess around making a phone call. It’d be window smashing time. I have a real problem with leaving kids in the car.. even for just a minute. I have two children btw. I would never leave them in the car in the heat! Should I come across this at any point in the future I will be calling the Police and getting permission to smash a window. Kids die in minutes in cars. Might also add that I would do the same thing should I see an animal in a locked car on a hot day. What about paying for petrol? I absolutely would. I would even argue that the whole process of wrangling them in and out of the car in the heat, for 30 secs of aircon time when you’re lining up to pay, would be hotter than leaving them for a couple of minutes lol. Thanks for the giggle Solidarity, I haven’t heard that expression/euphemism for years. To the OP, I don’t think you’re going to find anyone who agrees with leaving infants in a car on a hot day. I don’t think you’re going to find anyone who would argue that cars don’t get unbearably hot on a warm sunny day (although you might find a few who just ignore the phone while driving, thus reducing complicated A/C / window/volume/losing concentration situations). Obviously, if you see a child (or pet) in a closed car on a hot day, take action, report it, get help, but again, I don’t think you’d find anyone here who would disagree with that. As a parent, I think one of my greatest fears is inadvertently leaving my child/ren in a dangerous situation, because you can’t fix a problem you don’t know about. But that’s a different situation and a different conversation entirely. Giving benefit of the doubt is the easy way out though. Imagine if you tripped over in the street and couldn’t get up and everyone just moved around you? People die through the inaction of others. Anyway, I’d argue that it’s not a socially acceptable thing to say. Given the conditions, it seemed irresponsible, although I am stuck for similar examples to solidify my point. Yep, bad analogy, (but I bet that good for nothing father would indeed step over the person laying on the street). Seems that your argument now is that it was socially unacceptable to say it (within earshot of you), and that given the conditions it ‘seemed’ irresponsible to ‘possibly’ have left the ‘tiny helpless’ kiddies locked in a rapidly heating metal box. You forgot also that whilst he was away they could have been letting off the handbrake and rolling away or could even have got out of the car and be wandering around a carpark. But my money is with the fact that they weren’t endangered at all. Agreed, there are a few assumptions that need to be drawn to come to the conclusion that kids were in danger. I did save myself the hassle of “probably unnecessary” confrontation by keeping my mouth shut at the time. I can only assume that it was all good in the end. The point of the whole topic was to gather a general consensus on the validity of my thought process. *There a number of people who are of the opinion that I should not have bothered as there are too many unknowns. Thus, on the latter point, it seems that in these situations the general consensus is to ignore such a comment and continue about one’s daily business. I guess I have nothing to worry about then! Thanks RA. As for ending a phone call abruptly due to not having the AC on for 2 minutes… really? Why is this generation so needy? Do most people even use AC? I sure don’t. I’d say most people use AC, fans or have the windows down. In my case I had to turn off the ventilation system altogether to facilitate the conversation (as windows are generally worse for noise). Granted I may have achieved an acceptable compromise by turning it down to half power, however this is beside the point of the story which was to illustrate just how quickly cars can heat up in the sun. The inside of a car can reach 70C on a 30C day. 75% of this heat increase occurs within 10 minutes. If you combine that with zero airflow to evaporate your sweat (like in a parked car), things get uncomfortable pretty quickly. Also, side note: It’s generally (depends on your car) more efficient to use AC above 80km/h than windows down due to the exponential relationship between air resistance and speed. At high speeds, windows down creates more drag and increases fuel consumption more than AC would. My thinking is that if the guy was expressing urgency about the situation, then there’s a good chance he was feeling guilty about leaving them in the car. Sure they might have been teens able to manage their own temperatures or have the A/C running, but then perhaps he wouldn’t have said anything. Someone who was completely oblivious to the dangers might have never mentioned it at all, so maybe some credit to this guy for at least being aware of his actions. who’s to know they weren’t 12 and 14 and sitting there with the doors open just waiting till dad gets back. They’d have an app to tell them they were overheating. who’s to know they weren’t 12 and 14 and sitting there with the doors open just waiting till dad gets back. it doesn’t mean babies locked in unable to control anything. He may have simply wanted to terminate a boring conversation and needed an excuse to go. More sophisticated types get their phone to ring on command. It’s not only kids, but old people and animals shouldn’t be left in hot cars. I pulled in and parked and noticed the car next to me had a 90 + year old lady near dead left in a hot hot car at Bunnings Belconnen last summer. I had to open the doors of the car as she couldn’t get the back door open, she could barely hold her arm up . Her Daughter turned up with a trolley with a few things in it just as I was going to run off and get some water. So hang on a sec….an overheard coversation seems to be turning into a bit of a lynch mob. Middle aged man could well have had older children who are quite trustworthy when left for 10 to 15 minutes. Not saying it doesn’t happen, but maybe need to slow down a bit on the presumptions here. This site is turning into a bit of a ‘mothers’ corner of over concern. I was thinking the same thing. Trolls don’t exist just on the internet. I vaguely recall a long lost friend saying these exact same words – without substance – just to shock and bait.